Some trucking companies offer their own schools. This can also be a good option but be aware of a couple differences. For starters, a company is going to train you according to what THEY want out of you. They have a certain set of equipment, a certain set of rules, and sometimes a certain type of freight. For instance, many of the bigger companies now have fleets of fully automatic trucks. You won't learn how to manually shift a truck which will severely limit your options if you decide to go elsewhere. Secondly a trucking company will make a trade-off with you. They will often require little or no money up front but instead will allow you to pay back the money by paying you a little bit less and requiring you to remain with them for a certain period of time, usually one year. This is sometimes a necessary trade off if you can't afford the up front money or qualify for financial aid at a private school. If you do decide to go this route find out what the company's policy is on paying them back if you don't fulfill your obligation to them. Generally they will prorate the amount you owe them based on how long you worked there. An example of a company specific policy could be mountain braking. There are several different schools of thought on proper braking techniques for going down a mountain. If a company's safety department is convinced that one particular way is the best way then they may not even cover any other theories, or possibly even try to convince you that any other way will be disastrous. 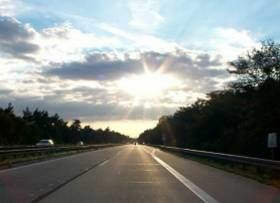 Once you get your license and get one year of safe driving experience under your belt the sky is the limit. Pretty much any company in the country will hire you with those simple credentials. As you know there are usually a number of different ways to accomplish something and since you will be the one whose life is on the line, wouldn't you like to know all of the options so you can use your own judgment and have a more thorough understanding of the topic? Also, every company has different policies when it comes to your logbook. Some have much tighter regulations than others. Whatever their policy is will be the only way they will teach it. Often times a company will require things above and beyond the federal DOT guidelines. These requirements may be a hindrance at a company with more lenient policies. Be aware of this type of teaching. Personally I haven't come across anybody who regretted their schooling decision. The major reason for this is that you will really only learn about 5% of what you will REALLY need to know in school. The rest you will learn from experience. Once you get your license and get one year of safe driving experience under your belt the sky is the limit. Pretty much any company in the country will hire you with those simple credentials.